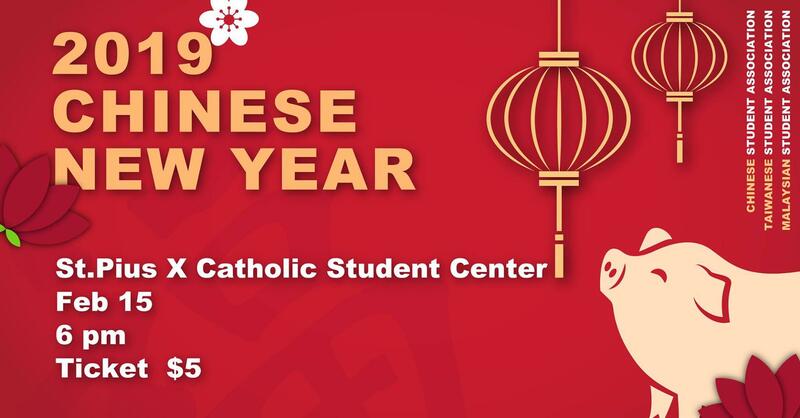 Come celebrate the Chinese New Year on Friday, Feb. 15, at 6:00 p.m., at St. Pius X Catholic Student Center, 301 E Cleveland St (across the street from the Overman Student Center). Students from China, Taiwan and Malaysia will provide cultural performances of song and dance. A Chinese meal will be catered by Happy Family Restaurant. This event is hosted by the Chinese Student Association and the Taiwanese Student Association. The community is invited. Tickets are required and can be purchased in advance for $5. Tickets will be available starting on Feb. 7 in the International Office, 118 Whitesitt Hall, and from members of CSA and TSA. For more information, contact Zhonghong "Nate" Jin, at zhanghong.jin@gus.pittstate.edu.